Born into a family of musicians, in St. Petersburg, Russia, Ms. Maria Khavin started playing piano by ear at age five and began piano and theory lessons the following year. She then attended a Children’s Music School and subsequently graduated with honors from State Music College of St. Petersburg Conservatory, earning degrees in Piano performance, pedagogy and accompanying. Since moving to Seattle in 1992, Ms. Khavin continued to be an active performer and became a passionate educator. She has maintained a private piano teaching studio for over 15 years, instructing to students ages four to adult. As a soloist and collaborative pianist, she appeared in numerous piano solo performances, accompanied hundreds of instrumentalists and vocalists, students and professionals. In summer of 2014 she was a guest soloist with Fort Worth Symphony Orchestra, performing Mozart’s Piano concerto in G major. In Seattle, she worked with Lyric Opera Northwest, Seattle Concert Opera, NOISE for kids, Mahler’s Festival, among many other professional organizations. Most recently, she became a Ladies Musical Club Performing Member, presenting several concerts a year. Currently, she is pianist/ choir accompanist at Northlake Unitarian Universalist Church in Kirkland, WA. 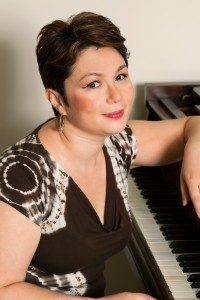 Ms. Khavin holds Master of Music degree in Piano Performance from the University of Washington, where she studied with Professor Craig Sheppard. She is also a certified K-12 music teacher and enjoys teaching a variety of musical subjects in a public school setting. Ms. Khavin is known for her positive style of teaching, a patient and considerate approach to each student. Her long-term focus with each student is to create strong, well-rounded musical talents. Extensively trained as a classical pianist, Ms. Khavin also enjoys and encourages her students to explore a wide variety of musical styles.